Today is my son Zach’s 22nd birthday and he is sick! Bummer! He went to the dr this afternoon and they said he has a virus so there’s not much they can do for him. So I made him some homemade chicken noodle soup for his birthday dinner. 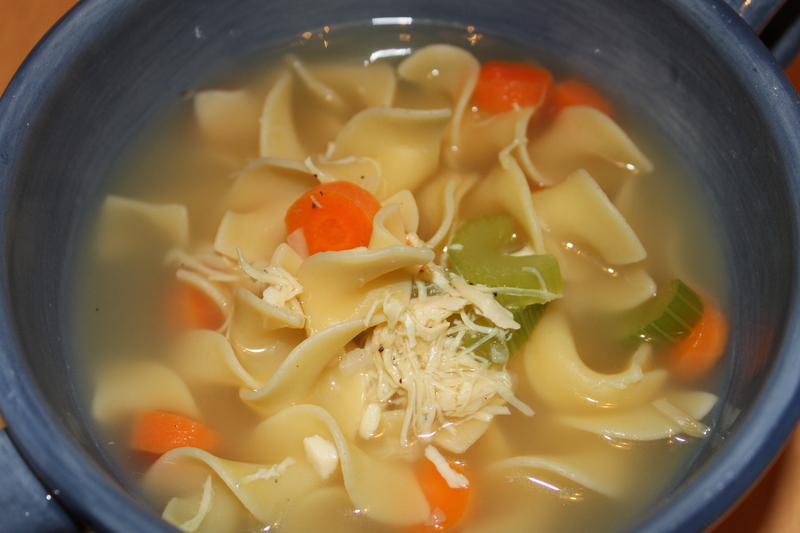 I like this recipe because it is so quick, easy and it tastes so soothing when you’re sick or it’s cold outside. I’m giving you a quick version and then an even quicker version, both are good. This is another recipe that I’ve had for so long that I can’t remember where it came from. Version #2 (the quick version) – Omit dried onion and celery flakes. Substitute with 1/2 – 1 cup chopped onion, 2 – 3 sliced celery stalks and 2 – 3 thinly sliced carrots. Add to boiling water with rest of ingredients. I made version #2 but with dried onion instead of fresh.